In one (blizzard) which visited Dakota and the States of Montana, Minnesota, Nebraska, Kansas and Texas in January, 1888, the mercury fell within twenty-four hours from 74 degrees F above zero to 28 degrees F below it in some places, and in Dakota went down to 40 degrees F below zero. In fine clear weather, with little or no warning, the sky darkened and the air was filled with snow, or ice-dust, as fine as flour, driven before a wind so furious and roaring that men's voices were inaudible at a distance of six feet. Men in the fields and children on their way from school died ere they could reach shelter; some of them having been not frozen, but suffocated from the impossiblility of breathing the blizzard. Some 235 persons lost their lives. This was the worst storm since 1864; the Colorado River in Texas was frozen with ice a foot thick, for the first time in the memory of man. Tetzlaff remembers the storm in the 1960 recording made when she was 85. She survived the storm in her parents' home on a farm in what is now northeastern South Dakota She recalls that within hours, the temperature dropped from seventy-four degrees to minus forty. 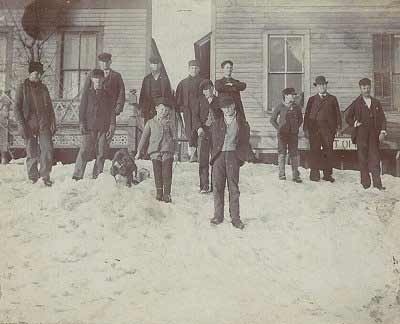 The storm was named the "Schoolchildren's Blizzard," because many children were caught in one-room schoolhouses, including Tetzlaff's classmates. "Two men tied a rope to the last house and went in the direction where the schoolhouse stood. And when they got to that place they tied it to the railing and made each child take a hold of the rope and walk down to the end of the rope, where parents came and took the children on home." Most victims of the blizzard were children making their way home from school in rural areas and adults working on large farms. Both had difficulty reaching their destinations in the awful conditions. In some places, though, caution prevailed. Schoolteacher Seymour Dopp in Pawnee City, Nebraska, kept his 17 students at school when the storm began at 2 p.m. They stayed overnight, burning stockpiled wood to keep warm. The next day, parents made their way over five-foot snow drifts to rescue their children. In Great Plains, South Dakota, two men rescued the children in a schoolhouse by tying a rope from the school to the nearest shelter to lead them to safety. Minnie Freeman, a teacher in Nebraska, successfully led her children to shelter after the storm tore the roof off of her one-room schoolhouse.